As food service manager at East Ridge High School, the largest school in Lake County, Laurie Elliston begins her work day at 5am, overseeing the preparation and serving of more than 9,300 breakfast and lunch meals a week. Organization also is required to get students through the food lines swiftly. 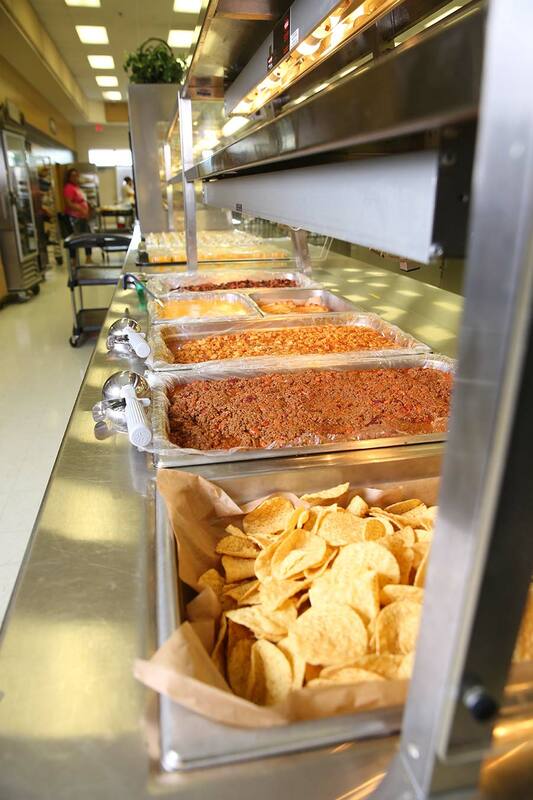 Breakfast and lunch are now free for all Lake County Schools students, regardless of income. Thanks to the Community Eligibility Provision, the federal program allows schools in low-income communities to provide meals at no charge. However, students do pay for snack foods and additional menu items. Laurie says the high school cafeteria of today has evolved into food stations with more choices. 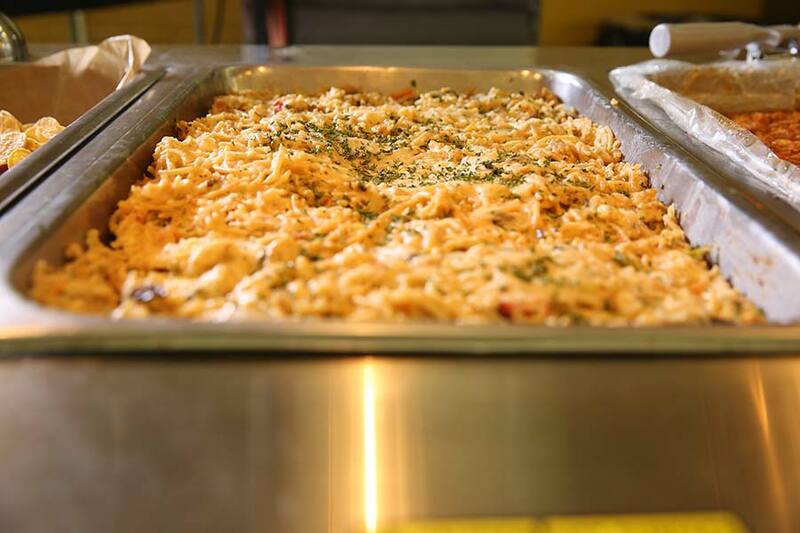 There’s a hot pizza line with varieties including Buffalo chicken pizza, French bread pizza, pepperoni, and cheese; a hot sandwich line; a wraps and fresh salads station; and the main food line, which often has “comfort food,” such as chicken and mashed potatoes. The main food line also features a daily theme, such as Italian, Southwest, Asian, Homestyle, or Bits and Pieces, which is chicken chunks or fish sticks with macaroni and cheese. “That day (Bits and Pieces) on the line is ridiculous, and we are totally prepared,” says Laurie, whose own favorite school lunch is roasted turkey and homemade dressing at Thanksgiving time. 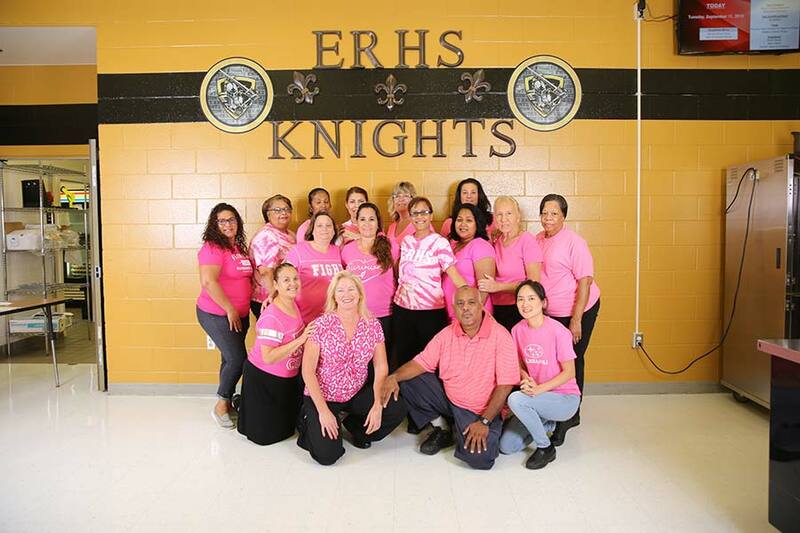 Every Friday, Laurie and her close crew get decked out in pink for their colleague, Terryann Venezia, a breast cancer survivor, whom they affectionately call Chef Diva. Now in her 21st year of food service with Lake County Schools, Laurie began at Minneola Elementary when her oldest of two sons started kindergarten. She believes working in the school cafeteria is ideal for parents with children. “It’s wonderful, and they recently changed it so we could get paid year-round like teachers do,” she says. Boil water and salt in steam-jacketed kettle or stock pot. Add spaghetti. Cook until firm-tender, 8 minutes. Drain and hold in cold water. Set aside. In steam-jacket kettle or large sauce pan, heat the vegetable oil. Add the vegetables, sliced mushrooms. Sauté vegetables 5 minutes or until tender. Set aside. Melt margarine in steam-jacket kettle or stock pot. Add flour and cook 5 minutes. Slowly add milk to the flour mixture. Simmer, stirring frequently, until the mixture is thickened. Add chicken stock, pepper, onion powder, and garlic. Simmer for 5 minutes. In each steamtable pan (12-by-20-inches, by 2½ inches deep) combine 3 pounds, 12 ounces (3 quarts) of cooked spaghetti, 3 pounds 9 ounces cooked diced chicken, 1 quart cooked vegetables, and 2 quarts and 1 cup of sauce. Bake until golden brown in 350-degree convection oven for 35 minutes. Cut 5-by-5 inches from each each pan (to get 25 pieces per pan). Hold for hot service at 140 degrees. Mix first three ingredients, then add the remaining ingredients. Shape into balls, one teaspoon each, on ungreased cookie sheet. Bake 15 to 20 minutes at 325 degrees (do not brown). 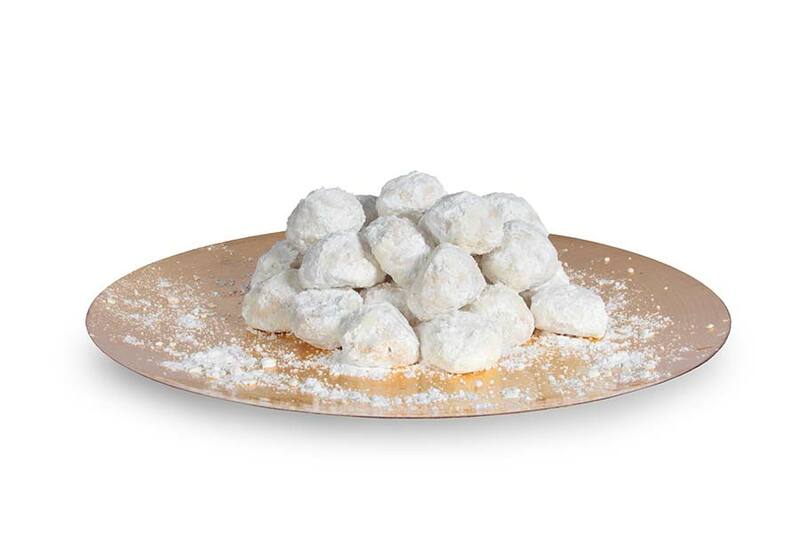 Cool, then roll in confectioners’ sugar.